The state of Kelantan in peninsular Malaysia shares its border with the province of Narathiwat. Although its population is predominantly Malay and Muslim, Kelantan is also known for pockets of Thai settlements in the rural areas, particularly in the districts located close toThai Malaysia border. In fact, despite the label given to the state as the corridor of Mecca (Serambi Mekah) and the bastion of Malay culture, there exist in Kelantan at least twenty Budddhist temples and numerous Buddhist places of worship known as samnaksong. Apart from that one can also find that the largest Buddha statues in Malaysia are located in Kelantan. The existence of Buddhist temples in the midst of so-called orthodox Malay society seems to be a dilemma in itself, but further investigation shows that Buddhism and Islam can be practised within the same social and cultural sphere without generating much inter-ethnic and religious tension. The aim of this paper is to highlight some of the factors that have made possible for Buddhism to operate in a Muslim setting, particularly in a social and cultural environment often associated with Islamic fundamentalism. Despite the fact that Theravada Buddhism is a minority religion, it has not only survived in Kelantan, but it has also flourished in many ways. The argument here is that the presence of Islam, often associated with radicalism, and lately with terrorism, has not actually been perceived as a threat to the very persistence and continuity of Buddhism. As seen in the case of Kelantan, the two religious traditions have a long history of co-existence dating back to many centuries, often with one informing the other in terms of belief elements. The interplay of two different religious traditions in a social and cultural setting dominated by one religion can be of theoretical interest since it gives some insights into the process of adaptation and acceptance on both sides of the belief systems. Not only Buddhism has to come to terms with the fact that it is a religion adhered to by a minority population, but it also has to address itself to the question of making itself relevant in a social and cultural context that has potential for conflicts and hostilities. While the Malays may not be openly supportive of Buddhism in general, nevertheless they appear to be quite tolerant to the presence of temples and monks in their immediate neighbourhood. This paper is divided into two parts. The first part gives a general picture on the Siamese and the practice of Theravada Buddhism in Kelantan. In this respect it is important to emphasise here that Buddhism has always been identified with the Siamese ethnic group. It will be argued that the very survival and persistence of Buddhism in Kelantan depend on the role the Siamese play as the custodian of the religion. The second part will look at the way Theravada Buddhism adapts itself to the local context, by resorting to various mechanisms to ensure the persistence and continuity of the religion. One of these is by making the religion appear non-antagonistic to the local Malays, typically by subscribing to Malay symbolism and by limiting the religion to certain ethnic groups. On the other hand, we will see how Theravada Buddhism appeals to the Chinese by entertaining to their religious needs, thereby benefiting from all the financial support needed to run the temple. The Siamese of Kelantan constitute about one percent of the state population. Unlike other immigrant ethnic groups, they have established themselves in Kelantan long before the mass arrival of Chinese and Indian immigrants in the early part of the twentieth century. Second, the Siamese are rural dwellers in contrast to the Chinese who are more inclined to live in urban areas. Written records concerning the establishment of Siamese villages in Kelantan are not readily available while the dates of their foundation still remain a matter of speculation. However, oral traditions indicate that many of these settlements are over 100 years old. In fact, in some places Siamese villages are known to predate their Malay neighbours. It appears that the migration of Siamese settlers before the present century from southern provinces of Thailand was a regular occurrence. Obviously the prevailing social and political circumstances of the period helped to facilitate the migration since Kelantan was then a vassal state of Thailand. Hence, the reality of pr?sence siamoise has to some extent been responsible in terms of mellowing down open hostility or resistance of the local Malays, if any, towards the migration of the Siamese into Kelantan river plain in search of new lands. That the Siamese faced no Malay objection is also attributable to the fact that they did not actually compete with the Malays since they chose to settle in areas that were originally covered with jungles or swamps. There is also evidence to suggest that local Malay chieftains actually encouraged the Siamese to settle in their respective territories especially in places where the original population had depleted tremendously. Apart from that the Siamese occupy a special category in the ethnic classification of indigenous population of Kelantan. Because they have established themselves in Kelantan since ?immemorial time?, the state recognizes them as almost similar to Malays on many administrative matters, in particular with regard to land ownership in areas designated as Malay reserves. Other special privileges include the participation in government sponsored investment schemes, Amanah Saham Bumiputra and Amanah Saham Nasional, normally reserved for Malaysians of indigenous (bumiputera) status. The question of Siamese political status in the wake of Malayan independence has been addressed by Roger Kershaw in great detail (see Kershaw 1984). The issues raised by Kershaw reflect the kind of anxiety experienced by the Siamese during the period after independence. There have definitely been some uncertainties regarding the granting of citizenship status to the Siamese, the mechanism of which was often misunderstood and left to the discretion of local registration officers. Kershaw’s analysis of the situation highlighted the kind of miscommunication between the Siamese and petty officials at the registration office in the districts. Although they were never accorded bumiputera status the Siamese were nevertheless recognized as ‘native of Kelantan’, especially for the purposes of ‘land transmission in general’ in accordance with the Land Enactment Act of 1938 (ibid. : 55). The question of citizenship after independence was never a real issue insofar as the Siamese were concerned, since federal citizenship was eventually extended to most of them. Two features best describe Theravada Buddhism in Kelantan. It is basically a rural phenomenon because nearly all Buddhist temples in Kelantan are located in rural areas. Second, since temples are normally located in Siamese settlements, or in villages where the Siamese form the bulk of the population, Theravada Buddhism tend to assume Siamese characteristics and forms, not only in the ritual contents but also in the architectural style of the buildings. Apart from that nearly all monks who serve for long-term period, and those who become abbot are Siamese with the exception of one or two. On the whole one can safely say that leadership of the state Sangha is controlled by Siamese monks. Even in villages whose entire population is ethnically Chinese, the structure of temple rituals are also predominantly Siamese, while the resident monks are most likely to be Siamese, either seconded from other temples in Kelantan or ?imported? on semi-permanent basis from Thailand. The social function of Buddhism among the Siamese of Kelantan should also be seen in another dimension involving ethnicity in particular. In the context of the wider Malaysian society where religion often forms the basis ethnic differentiation, perhaps it is not an understatement to say that Buddhism, especially of the Theravada kind, underscores and defines Siamese ethnicity in the same way Islam is to Malay ethnicity. As I have argued elsewhere (1987, 1990a, 1990b, 1993a and 1995) Buddhist temples are not only symbolically important to the Siamese but Theravada Buddhism in particular defines Siamese ethnicity vi-?-vis that of other ethnic groups. Hence, despite all odds against it as a minority religion great efforts are put in by the Siamese to ensure that the monastic institutions continue to survive. While some of the more traditional functions of the temple may no longer exist, its role in underscoring Siamese ethnicity remains important if not deliberately overemphasised. It is in this sense that the monastic institution may have played roles specific to the local context. While Buddhism is the state religion in Thailand, in Kelantan it is not. Hence the organization of Buddhist religion in Kelantan takes place within a very specialised context. This by itself contributes to certain complexities in the practice of Siamese Buddhism in an environment dominated by Islam. For instance, certain Buddhist rituals have been selectively modified to suit local need and demand, including re-scheduling of temple events to suit non-Buddhist calendar and Muslim public holidays. Another complexity related to Siamese Buddhism in Kelantan is the fact that it also tolerates certain elements of Chinese religion. For instance, Siamese temples with a large number of Chinese supporters recognize the importance of Chinese deities including the goddess Kuan Yin and Tua Pek Kong. In some temples images of these deities are often given a respectable place although they are not necessarily erected at the most sacred location within the monastic compound. By being accommodative to the religious need of the Chinese, these temples are guaranteed of continuous support of Chinese worshippers, even if they only come to pray to their respective deities. There are twenty Buddhist temples in Kelantan and a number of resting places for monks (sala phak song). Collectively these temples form part of the larger social and religious network that covers not only Kelantan, but also southern Thailand and northern Terengganu (Map 1). If we consider the export monks from Kelantan to serve Buddhist followers in other places in peninsular Malaysia and Singapore, then the network covers a much bigger area. The only thing is that they also have to compete with monks who originate from temples in other parts of the country, typically those from Kedah, Perlis and Penang, or for that matter, from Sri Lanka. Buddhist temples in Kelantan come under the jurisdiction of the chief monk of Kelantan, whose official title in Malay is Ketua Besar Sami Budha Negeri Kelantan. This title is better known informally among the Siamese as caw khun although the official one would have appropriately been caw khana rat. Serving under the caw khun are four ecclesiastical district heads known as caw khana amphoe who are responsible to a number of temples in their respective district. These religious districts do not necessarily coincide with government administrative districts (jajahan in Malay). As such in a district with a large number of temples, such as in Tumpat, there are two positions of ecclesiastical heads. In places where there is a single temple or two, the position of caw khana amphoe covers more than one district. For instance, temples in the districts of Bachok, Pasir Puteh and Kota Bharu come under the jurisdiction of only one ecclesiastical district head. Officially appointment of Sangha head of Kelantan is endorsed by the Sultan. Since the ruler is a Muslim, the endorsement is merely symbolic but the implication it carries is very crucial, at least in terms of giving some kind of political and social legitimacy necessary for the Sangha to operate smoothly under some sort of royal protection, perhaps in similar format to that of Thailand. Hence letters of credential from the royal palace in Kota Bharu are issued every time a new chief monk is appointed, although the ceremony nowadays may be done in a very concise manner with only representative of the sultan present instead of the king himself as it used to take place during the good old days. Despite the royal patronage temples in Kelantan are besieged with a common problem: a decline in the number of monks. Apparently most temples have to make do with whatever number of monks available even to the extent of appointing junior monks to become abbots. In some places, the number of resident monks is hardly enough to maintain the quorum of four monks (song), the critical number needed before an assembly of monks can conduct important temple rites. Until recently some temples have to close down because of inadequate number of monks. But the problems are often solved by borrowing monks from other villages that have a surplus or by importing monks from Thailand. In the later case however, these monks have to enter the country on social visit passes and therefore have to bear the inconveniences of going to the immigration check point every month to their passports stamped. The dwindling number of monks, however, does not seem to have an adverse effect on the frequency of ordination ceremonies in Kelantan. If one goes by the number of ordination ceremonies per temple, then the number of monks are more than enough. However, as the case turns out to be, the frequency of ordination seems to have little co-relation with permanent staffing of the clergy. Usually there are two types of ordination: short-term and long-term. Short-term initiates remain monks for a few days, between three to seven days. Since the purpose of the ordination is to fulfill vows by way of making merit for deceased members of the family, it is often known as buad bon. This type is more prevalent among the Chinese. As a contrast, long-term ordination is taken more seriously with the candidates being required to study the procedure of ordination and monastic rules beforehand, usually by first being ordained as novices (nen) or by serving as temple boys (dek wat) for a length of time. Once ordained, these monks are expected to remain longer than the token period. A stay of at least one period of lent (phansaa) is expected of the candidate. However, the standard practice is to urge the newly ordained to remain in the Sangha for at least three years with the hope that the incumbent would eventually change his mind and decide to remain for a much longer period. In practice a stay of three years is also considered long enough for one to achieve some level of proficiency in conducting monastic rites. Despite all the persuasion, there is no guarantee that the ordained will remain for any length of time. There is always the possibility of the young monks being drawn away by job opportunities elsewhere. Buddhist temples in Kelantan have developed various strategies for survival as a minority religion. First, as a matter of prime consideration the Sangha organisation of Kelantan takes a non-confrontational stand against the majority population which is predominantly Muslim. Indeed, as a proof that the religion has accommodated itself to the local need, the Sangha formally acknowledges the patronage of a Muslim ruler. Second, the survival of Buddhism is related to the continuous support it receives from the local Chinese community. Hence, Chinese money is badly needed to maintain temple expenses and to defray the cost of construction of temple buildings. Third, there exists a close relationship between the Sangha body of Thailand and that of Kelantan. This means that the latter could always rely on the former for assistance and guidance in matters related to the corpus of religious knowledge and the conduct of rites and ceremonies. As a matter of fact, the Sangha of Thailand has always been the source of scholarly and religious reference for Kelantanese monks. As mentioned, the formal Buddhist ecclesiastical organisation of Kelantan recognises the Sultan of Kelantan, a Muslim ruler, as its symbolic patron and protector. This arrangement could be traced back to the historical past when Kelantan was a vassal state of Thailand during which local rulers were expected to after the interest of Siamese Buddhists subjects. As part of his responsibility towards his Buddhist subjects, the Muslim ruler himself endorses the appointments of chief monk and ecclesiastical district heads. This gives rise to a type of state-Sangha relationship which in many ways resembles that of Thailand, only that it is modified in Kelantan’s case by the presence of a Muslim ruler instead of the usual Buddhist king. This procedure illustrates the kind of accommodation the Siamese of Kelantan have made in order to give their Sangha body some kind of political legitimacy, perhaps similar to that which exists in Thailand where the king plays the same role. Thus in the absence of a Buddhist king, a Muslim ruler has been able to lend a ‘transcendental’ dimension as the protector of the Buddhist religion, acting as the protector of Buddhist religion (phutthasasanu pathampok). This particular relationship between a Muslim ruler and Sangha at first appears rather strange. Yet this relationship is not actually in conflict with Buddhist doctrine as it conforms to early developments of Buddhism in India under the royal protection of King Asoka. This kind of structural model involving state-Sangha relationship has been discussed S. J. Tambiah (1970:4) and may be useful in looking at the case in Kelantan. At the very outset the position of the king in relation to the Sangha is clearly defined and his role as protector of the religion entails no interference in the management of the religion. As emphasised by Tambiah, while being an integral part of the religious hierarchy, the ruler is not in the religion. In fact, having a Muslim as the patron works to the advantage of Kelantanese Sangha. In this regard Buddhism in Kelantan is vested with relatively greater freedom compared with the case of Thailand, since the Muslim ruler of Kelantan does not interfere in domestic affairs of the Sangha, nor does he go round visiting temples and scrutinise every aspect of temple business. Apart from that temples do receive some indirect benefits from the state. Temple land is exempted from paying land taxes as it is classified as similar to tanah wakaf (land dedicated for religious and charity purposes). Despite the exemption the temple receives no other direct benefit from the state. Senior monks holding administrative posts in the Sangha do not receive any allowance from the state in the manner Thai monks enjoy their nittayaphat allowance. In the case of Kelantan Sangha, it is out of this special relationship with the Muslim ruler that Buddhism has managed to draw the strength for its very persistence and continuity amidst the larger Malay Muslim society. With the ruler acting as its symbolic protector, Buddhism and those who profess the religion are assured of a legitimate existence even though their activities may be confined and limited to Siamese villages and temple grounds. The royal patronage also means that the Muslim Malays have to bear with the presence of the Siamese and the establishment of Buddhist temples in their immediate neighbourhood. With the ruler as the patron of Buddhist religion in Kelantan, it does not mean that the religion also has the liberty of spreading the faith indiscriminately to just any ethnic group. Far from that, there seems to be a general understanding that Buddhism should be restricted to the Siamese and other non-Malay ethnic groups. As such there is no concerted effort on the part of the Buddhist clergy to proselytise their religion to their immediate Muslim neighbours, in stark contrast with their intensive and deliberate efforts aimed at the Chinese. It appears that the Buddhist clergy recognises the ethnic boundary and social limitation when it comes to propagating the religion. Obviously the Malays are excluded as the main target of Buddhist missionary activities for the sake of avoiding unnecessary strains in the relationship between neighbouring Malay and Siamese communities. But the real opposition to the attempt at spreading Buddhism among Malays is most likely to come from the Muslim Religious Council (Majlis Agama Islam) which supervises the administration of Islam and looks after the interest of Muslim population in the state. The social and political cost of proselytising Buddhism to the Malays may take the form of adverse reactions from the power structure within the Muslim polity itself, which may even undermine the very existence of Buddhism. So far the Sangha manages to avoid any communal and inter-religious conflict by adhering strictly to the norms that Malays are not to be targeted as potential Buddhist converts. Despite the stand that Malays are to be left alone, the temple compound is not totally out of bounds to Malays. On the contrary, temple doors are open to them during most celebrations (ngaan wat). Hence crowds of Malays could be seen mingling with Siamese and Chinese within the monastic compound during these events. The main reason for Malays coming to the temple is that these events normally include entertainment of various kinds, such as shadow-puppet theatre (nang talung), musical revues (dontrii), and traditional dance-drama theatre (manora and mak yong). Other than Siamese and Chinese from distant and outlying towns and villages, Malays from immediate surrounding often constitute the bulk of the audience who contribute significantly towards the gate. During non-festive occasions too Malays also make frequent visits to the temple mainly for some other reasons. Quite a number of monks are noted for their ability to dispense traditional medicine and herbal formul?s for various ailments. Many monks are also known for their expertise in dealing with victims of black magic and sorcery. Malays who come to the temple during non-festive occasions are likely to be regular clients of these specialist monks. A common practice among Kelantanese Malays is to consult Siamese monks for cases that proved ineffective when treated by Malay practitioners. In fact, traditional taxonomy of Malay diseases and ailments tends to attribute certain types of illness to Siamese and Brahmanistic origin, including the infamous effect from the use of oil extracted from the corpse of murder victims or person who died a violent death (Thai: nam man tai hong: Malay: minyak mati dibunuh). Hence the prevailing belief is that the best treatment should be handled with the help of Siamese specialists. Cases suspected to be caused by black magic and sorcery of Siamese origin are quickly referred to these specialists instead of being sent to Malay healers (bomoh). Likewise, Malays do consult Siamese magician for ?augmentive? magic, such as in the case of those looking for charm medicine. Otherwise Siamese specialists are frequently approached for preventive and curative magic. In this regard, one could say that Buddhist monks and Thai specialists are not totally irrelevant to the social life of their Malay Muslim neighbours. The fact that Malays make use of services by Siamese specialists is nothing irregular in Kelantanese context. It has been a common practice given the fact that Malays and Siamese do share a common source in respect of pre-Islamic belief elements. Although strict Muslims frown upon this practice, nevertheless, the more liberal-minded Malays re-interpret the behaviour in terms of Islmaic concept of ikhtiar (literally means permitted ?efforts? in finding solutions to certain problems, including actions taken not necessarily within the realm of Islam). As mentioned earlier, although the organisation of Buddhism is under the sole control of Siamese ethnic group, temple doors are open to other ethnic groups as well. Chinese patronage in particular is solicited by the Siamese clergy because their participation in temple rituals brings material and other social benefits. To this extent Buddhist temples in Kelantan adopt an open policy which welcomes almost anybody, except Malays, to participate in the religious rituals. At this juncture it is most important here to highlight the special relationship between the Siamese and the Chinese supporters of Buddhist temples in Kelantan. The majority of the latter group belongs to a social category commonly known as “rural” Chinese. These are Chinese immigrants of earlier periods who have originally settled themselves in rural areas, instead of urban areas. Known to the Malays as Cina kampung (literally, ?village Chinese? ), the rural Chinese consider themselves more Malayanised than the mainstream Chinese, in many ways similar to the Baba group of Malacca, Penang and Singapore. The rural Chinese are noted for their close association with the Malays, and their adaptability to and superb knowledge of Malay language and culture. Most of their “front stage” behaviour is overtly and deliberately Malay to the extent of speaking Malay even among their own kind at home (Raybeck 1980: 252-254). Although the majority of the “rural” Chinese have adopted much of the local Malay culture they have not become Muslims. They have their own system of worship as typified by beliefs in the guardian gods of the village and patron deities of the house. Apart from the worship of their respective deities, the rural Chinese also patronise Thai temples and take part in Buddhist rites and ceremonies. It is in this sense that Thai Buddhism has also become the basis of identity for the rural Chinese vis-?-vis the larger, mainstream group. Most significantly, their participation in temple rituals makes them members of the same religious and social community as the Siamese. Their close association with the Siamese is perhaps attributable to the close kin relationships deriving from intermarriage between the two groups during the early period of Chinese migration when scarcity of Chinese females forced them to look for spouses from among the Siamese. Although intermarriages between Siamese and rural Chinese are not as common as they used to be, this kinship ties are widely acknowledged today even if neither group can trace them with genealogical precision. Given the rural nature of their orientation, Chinese of the ancient immigration period are more inclined to identify themselves with the Siamese rather than with the mainstream Chinese. Such identification is quite natural. Apart from their kinship relatedness with the Siamese, their familiarity with Buddhism, even if not of the Theravada kind, draws them closer to Thai temples, where the long-established kinship ties between the two ethnic groups are constantly being recognised and validated. In this respect Buddhist temples, acting as the focal point and social magnet, bring together Siamese and Chinese of Kelantan under a common interest; and participation in temple ceremonies ritualises this special alliance. The Chinese turn out to be the most generous and reliable supporters of the temple. Since Buddhist temples do not receive any direct grant from the government, donations from the Chinese laity and other Buddhist outsiders are indispensable. Indeed, the politics of temple survival is to attract as many Chinese as possible. As a general rule, a temple well endowed with material wealth is usually one which receives support not only from its village residents but also from outsiders, especially the Chinese. Hence the larger the number of people who come to the temple, the more money the temple could expect to receive in terms of donation. The majority of Chinese supporters of Thai temples reside in various parts of Kelantan and other small townships. They constitute what I call “weekend pilgrims”; namely people who make the rounds to visit temples during the weekends. Included in this category of worshippers are Siamese who originate from villages without temples, and those who have migrated temporarily to towns. Hence temples which have a large number of visitors, especially those frequented by the Chinese and these weekend returnees, tend to be more prosperous compared to those that receive few visitors; more visitors means more resources could be collected in terms of cash donations and material gifts. There is another pragmatic use of Chinese outsiders by temples. Whenever a temple needs to organise religious undertakings on a grand scale, various working committees are often set up. Included in these committees are prominent Chinese businessmen who have good contacts with politicians and the government. Their excellent rapport with Malay officers helps to facilitate dealings with the local authority. For instance, an application for a permit to hold various forms of entertainment during temple festivals tends to be speedily dealt with if it is arranged through Chinese businessmen who have contacts with officials at the district office. Hence it is always good politics for the Siamese to include in the temple’s working committee distinguished Chinese businessmen or community leaders in order to make dealings with the bureaucracy less problematic. What has been said above regarding the Chinese intermediaries is typical of brokerage role played by the Chinese community in Kelantan for the Siamese. Politically active Chinese are known to mediate on behalf of the Siamese in order to secure government aid for the temples (Kershaw 1973: 3). A number of Chinese politicians are known to offer various help to the Siamese in various matters in return of electoral pledges. This brokerage role is not limited to temple functions alone. Even arrangements to have electricity installed in the village are often facilitated by these intermediaries. Material and monetary support given by the Chinese business community in Kelantan may take some indirect forms. For instance, most temples buy building materials from stores whose owners are also their supporters. Such purchases are likely to be given huge discounts if not sold at cost. The temple can also expect other Chinese business concerns to make special contributions as well, such as sponsorships during temple events. Apart from that, through arrangements initiated by monks, many Thai youths and ex-monks find employment with the Chinese, especially in the construction and building industries. On the whole, contacts with Chinese businessmen and community leaders bring tangible benefits not only to the temple, but also to other Siamese, especially youths who are in need of employment. Perhaps a mention should be made here on the increasing involvement of the Chinese in temple affairs and the prevalence of Chinese architectural influence in some Siamese temples. Although it is quite common for Siamese temples to provide some space for the erection of Chinese deities, these statues do not normally occupy prominent location within the temple ground. However, of late the incorporation of Chinese elements and architectural forms has become even more widespread. In fact, in some places Chinese are already making some headway to the point of taking over nearly all aspects of temple affairs save for the part that deals with the actual running and conducting of Theravada rites. As Siamese temples now become more receptive to the need of the Chinese in terms of providing them with physical and social space for worship, more Chinese-type architectural styles are expected to be incorporated into physical design of the temple buildings and other structures in addition to existing Siamese ones. Of late too, certain cultural performances typically of Chinese origin are also held in the temple, in particular the lion dance. Normally these are incorporated as part of temple festivals and other official functions during which Chinese are expected to turn up in large number. An interesting example can be seen in recent changes that involve a temple in the village where I did my fieldwork in early 80?s. At that time there were two temples in the village , one of which was the main one where rituals and ceremonies were organized on a regular basis. The other temple, for all intents and purposes, had been abandoned because there were no monks residing there, and no rituals were conducted there for a long time. Because of this it is occasionally referred to as wat rang by the villagers. Then in early 90?s some Chinese from the state capital began to take personal interest in the abandoned temple. In 1993 a monk from Lopburi in Thailand was invited to take residence in the newly opened temple, although monks from the other temple could have easily been engaged in the exercise. Later, the main building which housed the original sermon hall was demolished to make way for a new building that was constructed in Chinese style. What happened next was that other structures in the temple were also demolished except for some buildings that were used as living quarters for monks (kuti). In their place were built new ones, including pavilions, statutes of Buddha and small buildings meant for safekeeping of cremation ashes. What is of particular interest here is that all of these structures were built in typical Chinese style, except for the ordination hall (bod). Even the bod itself is something out of the ordinary in terms of the design that is seldom seen elsewhere in Kelantan. While its roof is of typical Siamese fashion, the bod has no walls; the floor of the ordination hall is made of loose sand. What is really notable in the process of the reopening of the abandoned temple is that a standing statue of the goddess Kuan Yin occupies a prominent place in the front yard of the sermon hall. Another pavilion was erected to house a statue of another deity, Ni Le, the Chinese god of prosperity. Not only that, the wall surrounding the temple ground bears the green dragon motive designed in typical Chinese fashion. Because of the flowing motive of two dragons, with their heads facing each other at the main entrance and tails meeting at the back, the temple is now known among the villagers and outsiders as wat nag (dragon temple) or Wat Dua Naga in Malay (temple of two dragons). The temple now becomes the main attraction for Chinese visitors from other places both within and outside Kelantan. Because of the exceptional features, the temple has been accredited as a place of interest by the Ministry of Culture and Tourism. To signify this a marble plaque was erected by the ministry, thereby putting the temple on tourist map. However, despite its outward appearance as a Chinese place of worship, the ritual organisation of the temple remains Theravada in nature because the resident monks are all Siamese. The abbot, who came to take up the position since 1993, was originally from Thailand (Loo Heng Ann, 2003). Another important aspect of temple survival is that the state Sangha of Kelantan maintains a continuous relationship with the Sangha of Thailand. Although Kelantan Sangha is an independent religious body, in practice it is closely linked to the Thai Sangha in many ways. Therefore, it is most appropriate to say that at times the Kelantan Sangha could be seen as an extension of the Thai Sangha. The special relationship with the Thai Sangha provides Buddhist temples in Kelantan with easy access to standard monastic guidelines and practices. In this respect, the Thai Sangha serves as the benchmark against which Kelantanese Sangha measures its purity and conformity to accepted Buddhist practices; hence, any monastic demeanor could be quickly monitored and checked. On the whole, Thailand, for all intents and purposes, provides the cultural and religious storehouse from which the Siamese of Kelantan, together with their monastic institution, draw the elements necessary for the reproduction of Theravada tradition in Kelantan. Thus it is not unusual for the latest religious and cultural innovations that originate in Thailand to quickly find their way to Siamese villages in remote Kelantan not only through monks and laity who travel back and forth across the border but also through Thai television broadcast. In terms of scholarly pursuit, it is also in Thailand that one can find facilities for further religious training. Kelantanese monks who intend to make monkhood a career are likely to spend some time in temples in Thailand normally after being ordained to pursue higher studies in Buddhist learning, often sitting for various levels of ecclesiastical examinations organised by the Thai Sangha. Upon passing these examinations and after gaining sufficient experiences in meditation and other monastic practices these monks eventually return to Kelantan to assume leadership in the local temples. Many of the abbots now serving in Kelantan are likely to have gone through this process prior to taking their present post. As a “religious province” of Thailand, the Thai Sangha looks after monastic examinations for monks and laity in Kelantan. Hence nak tham examinations are held annually in at least two temples under the supervision of Thai Sangha representatives. As the syllabus is based on Thai curriculum, books and other study materials are all imported from Thailand. Through these examinations the standard of religious learning is maintained and regularly compared with that of Thailand. The special relationship with Thailand also means that there are frequent exchanges of ritual visits between monks and laity on both sides of the border. These are best expressed during various temple ceremonies. Senior monks from Thailand, especially those from southern provinces, are often invited to officiate at major temple functions as honourable sponsors (phuu upatham) or to deliver special sermons during the occasion. Their presence not only graces the event but adds authenticity to the ceremony. Sometimes pious laymen or laymen extraordinaire (Swearer 1976) accompany distinguished Thai monks on their rounds to Kelantan. During their visits they demonstrate to the local laity the finer techniques of performing monastic rites, including proper procedure of expressing respect to monks, and the right method of reading and chanting Pali verses. All these are expected to be diligently emulated by the Siamese laity in Kelantan. On other occasions Kelantanese monks, together with the laity, often travel to Thailand to attend various temple functions held there. It is also quite common for monks of some standing and those who are very senior to be called over to Thailand to be awarded various religious titles by the Thai Sangha. On these occasions ceremonial fans (phat jot) are given to them to symbolize their incorporation into the Thai ecclesiastical body. During important temple ceremonies involving large group of people the influence of Thailand can be seen even more prominently. Typical of this is the way cremation ceremonies of senior monks are conducted. I have the opportunity to witness one such occasion in June 1997, where the involvement of the Thai religious authorities was most prominent. The peak of the ceremony was officiated by the Thai consul based in the state capital, Kota Bharu. As representative of the Thai king his role was to symbolically deliver the funeral flame. Two officials from Thailand were specially dispatched to Kelantan to oversee and give instructions to the organising committee with respect to the actual running of the event, in particular during the climax of the cremation ceremony itself. The event was also widely announced over radio and television network in southern Thailand to ensure maximum participation of Siamese clergy and laity not only from Kelantan, but also from southern provinces of Thailand. Busloads of participants also arrived from Kedah and Perlis, two other states in the northwest part of the peninsula with a sizeable Siamese population. Although most Thai villages are scattered all over rural areas of Kelantan, it is during temple ceremonies that monks and the laity from other villages are brought together. They are expected to attend in large numbers bringing along material and monetary contributions to help defray costs. Advance parties of men, women and monks are often sent from various villages to help in the preparation of the events. Within the confinement of the temple?s compound were also held performances of Thai puppet shadow theatre and other forms of entertainment. The event looked more like a fun fair than a funeral rite, with Thai songs and music being played over loudspeakers throughout the day. To add further authenticity to the event, a rare musical band, which specialised in funeral music, was also brought over from Thailand. An interesting point about the event was that public announcements were made mostly in standard Thai instead of the southern dialect, which is widely spoken among the Siamese of Kelantan. It can be seen that temple undertakings of this nature also become the medium of expression for Thai solidarity, because attendance at these ceremonies goes beyond the religious; it includes social and cultural reasons as well. Relatives, friends and members of the clergy from Thailand are no exception to the list of people invited to the ceremony. Temple events therefore become the excuse for social gathering of Siamese of Kelantan as well as those from Thailand under a common religious banner. What appears to be a local religious affairs was actually a manifestation of Thai ethnic solidarity within the enclosed compound of the temple. As the events unfolded itself, the Siamese have proven that by pooling together their resources, and by appealing to other non-Thai co-religionists, especially the Chinese, they could consciously transform the ceremony into a focal point for the expression of their solidarity and sense of identity as a minority group. At the same time the collaboration of their ethnic and religious counterparts from Thailand proves that the Siamese of Kelantan are not alone; they are part of the bigger Thai diaspora outside Thailand. Thus by using religious personality, symbols and regalia imported from Thailand, they have demonstrated that they are part of the global Thai community. The persistence of Buddhist temples in Kelantan seems to depend on the way the Siamese have adapted themselves to the local context to the extent of adopting Malay sacred symbol. Thus by acknowledging the Sultan of Kelantan as the protector of Buddhism, the Siamese have assured for themselves and their religion a political legitimacy even if the bigger society is predominantly Muslim. At the same time, the Siamese clergy takes a non-confrontational stand by adopting the policy that no Buddhism should be proselytised among the Malays, a step which helps to diffuse potential inter-religious conflicts. Although there have been occasional cross religious conversions in both directions, these are not interpreted as a communal issue, thereby helping to diffuse inter-religious tensions. Even though the Siamese maintain a well-defined ethnic boundary, they do not close their doors to Malays who seek the services of Buddhist monks and other Siamese specialists. By so doing and by willing to share some of their cultural elements with the Malays, the Siamese manage to demonstrate that they pose no religious and cultural threat to the Malays. In terms of economic strategy, the Siamese rely on the goodwill of Chinese supporters who provide them not only with monetary and material donations, but also with other social and economic benefits. Foremost in this is the indispensable brokerage role played by the Chinese on behalf of the Siamese. As a mark of their gratitude, the Siamese accommodate themselves to the religious need of the Chinese, including ordinations of Chinese candidates, even though these are merely for token purposes. As mentioned above, some temples even go to a great length to please Chinese worshippers in order to secure their patronage. The very survival of Siamese Buddhist temples also depends on the good relationship they constantly maintain with the Sangha of Thailand. The support extended by the Thai Sangha means that Kelantanese temples operate as if they are part of the bigger network of Buddhism in matters related to ritual conducts and social management of the religion. 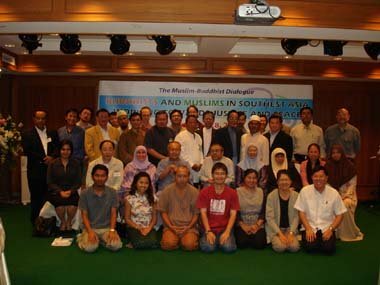 From the perspective of Kelantan Sangha, the Thai Sangha and Thailand in general remain uppermost in its effort of maintaining a continuous existence in a social and cultural environment which is predominantly Islamic. It appears that the Sangha body of Kelantan, for the sake of its very survival, has to maintain a dualistic existence. This is symbolised by two things: while the ceremonial fans given by the Thai Sangha formalise the close relationship between Kelantanese monks and those of Thailand, the letters of appointment from the Sultan of Kelantan formalise the acknowledgement and patronage of a Muslim ruler. As a concluding remark it can be argued that cultural co-existence between the Siamese Buddhists and the Malay Muslims in Kelantan seems to work well in a socio-political setting noted for its orthodoxy and fundamentalist traits. As a minority group, the Siamese have adopted various strategies to ensure the survival and persistence of Theravada Buddhism in the local context, including the use of Malay kingship as the symbol of Buddhist religious protector, the confinement of Buddhist religious evangelism to non-Malays and the appeal to the Chinese for financial and material support. Banks, David J. 1980. Politics and ethnicity on the Thai-Malay frontier: the historical role of the Thai-speaking Muslims of Kedah. Kabar Seberang 7: 98-113. Bonney, R. 1971. Kedah 1771-1821: the search for security and independence. Kuala Lumpur: Oxford University Press. Carstens, Sharon A. 1980. Pulai: memories of a gold mining settlement in Ulu Kelantan. Journal of the Malaysian Branch of the Royal Asiatic Society 53(1): 50-67. Cusinier, Jeanne. 1936. Danses magiques de Kelantan. Paris: Institut d?Ethnologie. Cushman, J. W. & A. C. Milner. 1979. Eighteenth and nineteenth-century Chinese accounts of the Malay peninsula. Journal of the Malaysian Branch of the Royal Asiatic Society 52(1): 1-56. Funston, N. John. 1980. Malay politics in Malaysia: a study of the United Malays Nationalist Organisation and Party Islam. Kuala Lumpur: Heinemann. Golomb, Louis. 1978. Brokers of morality: Thai ethnic adaptation in a rural Malaysian setting. Hawaii: University of Hawaii Press. Kershaw, Roger. 1973. The Chinese in Kelantan, west Malaysia, as mediators of political integration to the Kelantan Thais. Review of Southeast Asian Studies 3(3 & 4): 1-10. Kershaw, Roger. 1984. Native but not Bumiputra: crisis and complexity in the political status of the Kelantan Thais after independence. Contributions to Southeast Asian Ethnography 3: 46-71. Loo Heng Ann. 2003. Peranan masyarakat Cina Kelantan dalam menghidupkan wat Siam: Kajian kes di Wat Photikyan Phut Thak Tham di Kampung Balai, Bachok, Kelantan. Academic Exercise, Department of Southeast Asian Studies, Faculty of Arts and Social Sciences, Universiti Malaya. Malaysia, Government of. 1983. 1980 Population and housing census of Malaysia: state population report, Kelantan. Kuala Lumpur: Department of Statistics. Marriott, H. 1916. A fragment of the history of Trengganu and Kelantan. Journal of the Straits Branch of the Royal Asiatic Society 72: 3-23. Middlebrook, S. M. 1933. Pulai: an early Chinese settlement in Kelantan. Journal of the Malayan Branch of the Royal Asiatic Society 11:151-156. Mohamed b. Nik Mohd. Salleh. 1974. 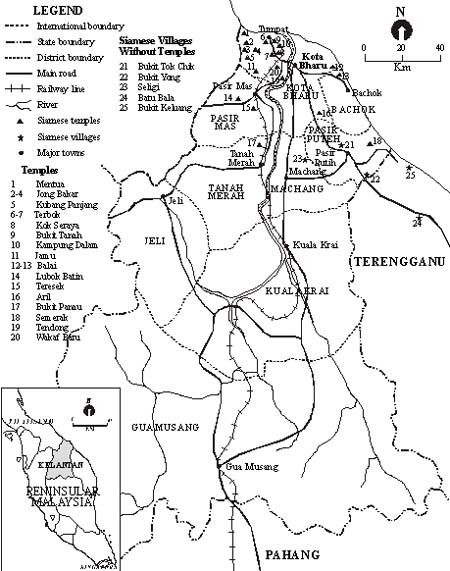 Kelantan in transition: 1891-1910. In William R. Roff (ed.). Kelantan: religion, society and politics in a Malay state. Kuala Lumpur: Oxford University Press. Mohamed Yusoff Ismail. 1982. Tradition and change in Aril, a Siamese village in Kelantan. Mankind 13(3): 252-263. Mohamed Yusoff Ismail. 1987. Buddhism and ethnicity: the case of the Siamese of Kelantan. Sojourn 2:231-254. Mohamed Yusoff Ismail. 1990a. Buddhism among the Siamese of Kelantan: minority religion in a Muslim state. Jurnal Antropologi dan Sosiologi 18:55-69. Mohamed Yusoff Ismail. 1990b. Siamese Buddhism in a Malay state: some notes on temple organization in Kelantan, Malaysia. In Sulak Sivaraksa et al (eds.). Radical conservatism: Buddhism in the contemporary world: articles in honour of Bhikkhu Buddhadasa’s 84th birthday anniversary. Bangkok: Sathirakoses-Nagapradipa Foundation. Mohamed Yusoff Ismail. 1993a. Buddhism and ethnicity: social organization of a Buddhist temple in Kelantan. Singapore: Institute of Southeast Asian Studies. Mohamed Yusoff Ismail. 1993b. Two faces of Buddhism: Chinese participation in the Siamese temples in Kelantan. In Cheu Hock Tong (ed.). Chinese beliefs and practices in Southeast Asia: studies on the Chinese religion in Malaysia, Singapore, and Indonesia. Petaling Jaya: Pelanduk Publications. Mohamed Yusoff Ismail. 1995. ;yflpk,.od]yo9yo ;kilkor6TlkloNL7dKk 06>k]’diGN,sk;bmpk]yp xumu # C[y[mu @ #*$_(Chulalongkorn Journal of Buddhist Studies) 2(1): 5-19. Mokhzani, B. A. R. 1973. Credit in a Malay peasant economy. PhD. Dissertation, University of London. Nagata, Judith A. 1974. What is a Malay? Situational selection of ethnic identity in a plural society. American Ethnologist 1: 331-350. Rahmat Saripan. 1979. Perkembangan politik Melayu Kelantan 1776-1842. (The development of Kelantan Malay politics 1776-1842). Kuala Lumpur: Dewan Bahasa dan Pustaka. Raybeck, Douglas. 1980. Ethnicity and accommodation: Malay-Chinese relations in Kelantan, Malaysia. Ethnic Groups 2: 241-268. Rentse, Anker. 1934. History of Kelantan I.Journal of the Malayan Branch of the Royal Asiatic Society 12: 44-62. Sharom Ahmat. 1971. Kedah-Siam relations, 1821-1905. Journal of the Siam Society 59: 97-117. Skinner, C. 1965. The civil war in Kelantan in 1839. Monograph No. 2. Kuala Lumpur: Malaysian Branch of the Royal Asiatic Society. Swearer, Donald K. 1976. The role of layman extraordinaire in northern Thai Buddhism. Journal of the Siam Society 64: 149-168. Tambiah, Stanley Jeyaraja. 1970. Buddhism and spirit cults in northeast Thailand. Cambridge: Cambridge University Press. Tan Chee Beng. 1979. Baba Chinese, non-Baba Chinese and Malays: a note on ethnic interaction in Malacca. Southeast Asian Journal of Social Science 7: 20-29. Tan Chee Beng. 1982. Peranakan Chinese in northeast Kelantan with special reference to Chinese religion. Journal of the Malaysian Branch of the Royal Asiatic Society 55: 26-52. Vella, Walter F. 1957. Siam under Rama III 1824-1851. Monograph for the Association for Asian Studies. New York: J. J. Augustin. Winzeler, Robert L. 1974. Ethnic complexity and ethnic relationship in an east coast Malay town. Southeast Asian Journal of Social Science 2: 45-61. Winzeler, Robert L. 1981. The rural Chinese of the Kelantan plain. Journal of the Malaysian Branch of the Royal Asiatic Society 54:1-23. Wyatt, David K. 1974. Nineteenth Century Kelantan: A Thai View. In William R. Roff (ed.) Kelantan: religion, society and politics in a Malay state. Kuala Lumpur: Oxford University Press, 1974. An earlier version of the paper was first presented at the Workshop on Historical and Linguistic Interactions in the Making of Southern Thailand/Northern Malaysia, Nakhon Si Thammarat, 5-7 February 2004. Throughout the paper I have used the term ?Siamese? to refer specifically to those who live in Kelantan and other parts of peninsular Malaysia , in preference to the term ?Thai?. As I have discussed elsewhere (1977, 1980, 1993) the term ?Thai? seems to be of recent usage in Kelantan although there is a big debate among the Thais themselves regarding the appropriateness of using the term ?Siamese? in contemporary context. However, for the sake of comparison and clarity of arguments used in this paper, the term ?Siamese? is used to differentiate them from the people of Thailand . According to the 1980 census, the population of Kelantan consists of the following: Malays 798,761 (93.1%); Chinese 44,967 (5.2%); Siamese, 7,557 (0.9%); Indians 6,122 (0.7%); and “Others” 784 (0.1%). Of the 7,557 Siamese, 6,820 (90.2%) are rural dwellers. The Siamese population according to the Population and Housing Census of Malaysia of 1991 was 8,301. The Thai Association of Kelantan estimated that the Siamese population of Kelantan in 1998 was 15,335. Royal Thai Consulate (KongsunYai) in Kota Bharu estimated a bigger number, close to 20,000. The role of Siam in the affairs of the Malay states has been covered by various scholars, including Skinner (1965), Wyatt (1974), Mohamed b. Nik Mohd. Salleh (1974), Marriott (1916), Rentse (1934) and Rahmat Saripan (1979). On the role of Siam in the affairs of Kedah and Perlis, see Bonney (1971), Sharom Ahmat (1971), Banks (1980) and Vella (1957). More details of this have been discussed in Kershaw (1984). Mokhzani (1973) discusses similar case for the Siamese who live in Malaysian states of Kedah and Perlis, where they are also allowed to own lands in Malay reserve areas. In other places, Siamese are considered as similar to Malays when it comes to political party membership. For instance in April 1994, a group of Siamese in the state of Perlis applied to be officially admitted as party members of UMNO (New Straits Times, April 14, 1994: 10). The party, a dominant partner in the Malaysian ruling coalition government, was originally set up exclusively for Malay membership, but the recent opening of its doors to the Siamese proves their acceptance as almost equal in status to indigenous Malays. On UMNO and its origin see, for instance, Funston (1980). Most Siamese settlements have a temple each, while other villages, which are too small to justify for the establishment of a full-fledged temple, may have a samnaksong ? a small building which provides shelter to visiting monks who make the rounds to preach and conduct Buddhist rites. There are twenty temples in the state with an average population of about five monks. While some temple events are held on exact lunar dates, such as maakhabuuchaa and wisaakha, other religious events may be scheduled for more suitable dates to take advantage of gazetted public holidays. Since weekend holidays in Kelantan fall on Fridays, which are Muslim holidays, major temple events are planned to fall on these days instead of Sundays, in contrast to the normal practice in Thailand . For instance, gift-giving (kathin) to mark the end of the lent period (phansaa), ordinations, and dedicatory celebrations are always planned for Fridays so that more people can participate in them. So is the case with other activities not bound by exact lunar dates; they are organized to coincide either with public holidays or with any of the Fridays. Although these two deities are definitely non-Siamese in origin, Chinese who patronize Siamese temples seem to attach great importance to both, partly because these two are highly relevant in terms of Chinese belief system and Mahayana Buddhism. However, royal patronage in itself is not a new phenomenon if we consider the fact that Kelantan used to be a vassal state of Thailand and the local Muslim rulers were often given specific instructions to look after the interest of Buddhist subjects under the directive of the Thai king. There are quite a number of lay magicians in Siamese villages who specialize in the making of love potions. In 1982 I was present when a Malay woman consulted an acaan wat expressing her concern for her husband’s second marriage. Fearing an impending divorce, she asked for some magical charms to entice her husband back. Apart from that it is not uncommon for Malays to ask Siamese specialists for magical formul?s for various purposes. They are even asked to forecast the location of lost items of jewelry or stolen cows and other domestic animals. Malays and Chinese who gamble in the four-digit lotteries are known to consult Siamese specialists for winning numbers. Golomb (1978: 71) mentions the case of minor wife of a king traveling all the way from the west coast to fetch some “love medicine” from a Siamese specialist (mo sanee) to enable her to win back the affection of her estranged husband. Although statistically, both “town” and “rural” Chinese are classified as a single ethnic group, basically there are fundamental cultural differences between the two. The majority of “urban” Chinese in Kelantan belong to the recent group of Chinese migrants that typifies the mainstream Chinese of the west coast states. While most urban-dwelling Chinese are descendants of late nineteenth and early twentieth century immigrants, most of the rural-based Chinese are descendants of those who arrived much earlier, perhaps as early as the fifteenth century. For more detailed discussion on earlier Chinese settlements in Kelantan, see Middlebrook (1933), Carstens (1980), and Cushman and Milner (1979). On Baba Chinese, see for instance, Tan Chee Beng (1979). For accounts of “rural” Chinese or the earlier group of Chinese immigrants, see also Winzeler (1974, 1981) Kershaw (1981) and Tan Chee Beng (1982). That the earlier Chinese migrant met little opposition from the Malay peasantry could have been due to the fact that the former must have arrived at the time when good agricultural lands were still abundant. Moreover, residence patterns seem to indicate that the Chinese did not compete with Malays for land, because the former chose to occupy less fertile land, usually quite close to rivers, while the latter preferred, for their padi cultivation, land away from the river banks (Winzeler 1981: 7). For instance, during the dedicatory celebration (ngaan chalong) of an archway of the temple where I did my fieldwork in 1983, several Chinese companies contributed money and goods for raffle prizes, including three brand-new motor cycles. In return, the firms were given permission to hang advertising banners at the main entrance and at other strategic locations around the temple.